Well I’m still getting over yesterday’s visits to the units with Sierra, it was truly an uplifting experience for me! And to end off by visiting CR4, with the lovely husband who serenaded to his wife while strumming with Sierra’s guitar and Sierra playing the fiddle…unbelievable, we were all moved by it. I must say Sierra handled herself in such moments as on CR4 with great style…what a well rounded and mature person, a true gem. Shirley, thanks so much for bringing us Sierra and having her perform, it was well received by all. I had a few staff members stop me today and say how wonderful it was and hoped she can come back! 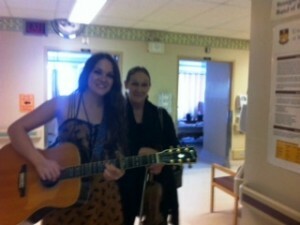 Thanks Helene for passing along the information of Sierra’s willingness to perform for our staff at the picnic in June. What a treat.